The holidays are the most wonderful time of the year. It’s a joyous occasion where we get to spend precious time with our loved ones and create new cherished moments. Our homes start to resemble a Charles Dickens novel and get filled with festive decor, jingly bells, lively Christmas carols and decadent treats. Although none of these things can harm a person, consideration must be made for our pets. I personally have four cats and I know the dangers of giving them or have lying around, foods that can harm them. Chocolate is abundantly available at Christmas and no doubt we will consume more than our fair share. Chocolate is a dangerous and poisonous food for pets, it can cause gastrointestinal issues, heart problems, seizures and even death, especially for dogs. Raisins are another food that can cause acute kidney failure in cats and dogs. Christmas cake is loaded with raisins and small fruit pieces that can fall from our plates and potentially harm an animal. Macadamia nuts can cause vomiting, tremors and weakness. It’s best to keep your pet on their regular diet but if you want to spoil them, give them treats that are made specifically for pets. My cats love organic squash baby food. A recent survey on the craziest things pet have eaten, may surprise and alarm you. Underwear, cellphones, used diapers and shoes, oh my! Cell phones are among the top household items pets will munch on. People may not realize how risky this is. Batteries, including those from cell phones, contain acidic or alkaline chemicals and heavy metals that are toxic to animals. Some batteries can pass an electric current that may damage or kill tissue. The best precaution is to keep them in a safe place away from our inquisitive pets. Open flame candles and liquid potpourri may create a special ambiance and be sentimentally appealing but can cause severe harm to a pet. The scented oils contain toxins that are poisonous to all pets. One lick could cause a chemical burn in their mouth followed by tremors, and difficulty breathing. Poinsettias are beautifully festive and synonymous with Christmas. They are part of the lily family and mildly toxic to cats. Symptoms are vomiting, drooling and sometimes diarrhea, but why put your pet through this if it can be avoided. Ornaments glitter and sparkle and attract the attention of our pets. Our cats love the stringed Christmas lights that flicker and were constantly jumping up trying to get them so we had to remove them. Any decorations that hang or dangle are open game to our furry family members. Small jingle bells make just the right kind of noise to mesmerize our pets and in one quick jump they can have the bell in their mouth and swallow it. Tinsel is another product that may seem harmless. 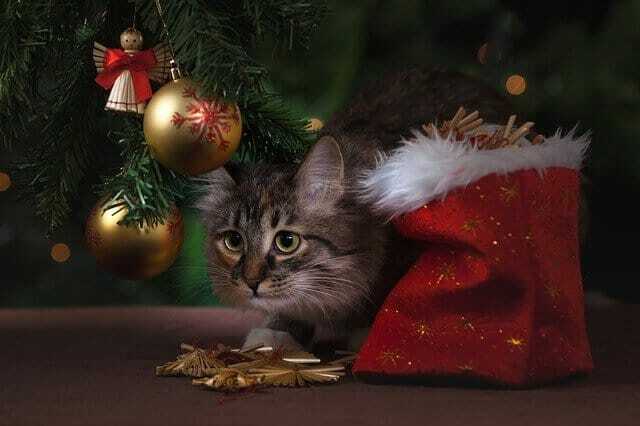 It may be cute to watch a cat chase and play with tinsel but if they ingest it, it will cause severe intestinal issues. It can get wrapped around their tongue and/or intestines requiring surgery. Our pets are rascals and much like children. They get into everything and want to put things in their mouth that they shouldn’t. Pets are curious and will test out unfamiliar territory so it’s up to us to create a safe environment during the holiday season with them in mind. I have two little Chihuahuas and I make certain that no garland, decorations or tree ornaments are within reach of them if they were to stand on their tippy-paws! We always practice keeping our buddies safe during this most wonderful time of the year. We dont have any pets yet,we cannot afford to. I don’t have any pets but it is definitely necessary to take good care of pets during the festive season. It would certainly spoil things if a pet got badly hurt. Really one only has to think about how to make a place child-safe, it’s practically the same for a pet. I knew poinsettias are poisonous to dogs and cats, but I had no idea that animals liked to munch on cell phones! You’d think they’d go for something a little more…flavorful? Thank you for all these great warnings! Helpful tips. Sometimes we ignore the most obvious. I treasure my furry friends. As a pet owner of three dogs and 15 cats I really appreciate this post. I have two Siamese cats and I never have Poinsettia plants in my home at Christmas.They are deadly plants for inquisitive pets. I thought I knew it all but holy did not know that a lick from a candle or potpourri can cause all that, thank you so much as I burn a lot of candles! my cats are spoiled and thing they are the king and queen of the house and the bad thing is they are, I love my cats, I hate to see someone that don’t take care of their animals. I make sure I never leave candles lit when the cats are around and I have to leave the room. One year my boys (3 cats) knocked my tree over 3 times and broke several ornaments. I learned to tie the tree to the wall…lol. They like to get underneath the tree and paw at the branches. They’re getting older and don’t mess around as much, but it’s still their favorite thing to do in December. Thankfully they haven’t eaten anything that’s bad for them. NOvember 28-I only recently learned that certain foods were DAngerous for pets. One of my daughters had a beautiful German Shepherd and she bought food for him only from her VEt and treats also. He was satisfied with that and had a beautiful coat. You know we are so carefully with our children and yet our pets get hurt because we just don’t think enough about their safety in our homes. My Mum lost her beloved dog when that dog food came from China a few years ago. Thank you for posting this – so many things that people don’t think of! I recently got rid of all interlocking foam (kids) mats in our house after the cat ate some and needed abdominal surgery! Not a holiday item but there are foam stickers and decorations out there for Xmas too.